Did You Know? With a focus on environmental sustainability and the innovation of natural gas industry team members, the thermal efficiency of California’s gas-fired generation improved more than 21 percent between 2001 and 2011. One source for nearly half the state’s power. Without natural gas, over 10 million industrial, residential and commercial customers would be without a key component of their energy needs. In fact, almost half of the power generated in California comes from natural gas. So with more utility gas customers than any other state in the nation, the skills, ideas and creativity you bring to this field make a real and meaningful impact to countless homes and businesses across the state. Across the energy system, engineers play a vital role in planning, designing and maintaining the infrastructure of our power grid, as well as natural gas discovery and extraction. 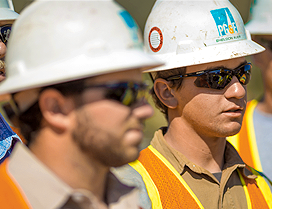 With a diverse range of engineering needs, including Civil, Chemical, Pipeline, Environmental, and many others, an Engineering degree places you within a critical point in designing and planning natural gas distribution. Tens of thousands of miles of pipeline are in use to bring natural gas to our power plants as well as directly to homes and businesses across California, and their installation and maintenance is critical to our energy infrastructure. By working with this role, you’ll have a direct impact on the energy needs and safety of customers throughout our network and within your community. Within Plant Operations, there are a variety of career paths to choose from that contribute to various aspects of plant operation, maintenance and safety. Whether you find yourself being drawn to Control Room Operator or Administrative Support Staff, you’ll ensure that energy needs throughout the state are met through operational efficiency and uptime.